While Mark Wahlberg and Peter Berg's Deepwater Horizon just hit theaters this past weekend (I'll be catching up with that one tomorrow) the actor/director duo (who also worked on Lone Survivor together) have already completed their next project together and are once again working within the realm of a tragic true story that turned average human beings going about their everyday lives and jobs into heroes. Patriots Day recounts Boston Police Commissioner Ed Davis's actions in the events leading up to the 2013 Boston Marathon bombing and the aftermath, which includes the city-wide manhunt to find the terrorists behind it. Three years removed from the marathon bombing and I can still remember exactly where I was when the news started pouring in about the events taking place at an even that was intended to bring unity and spirit to the city that was taken advantage of as an opportunity to diminish both such goals. In this rather somber first trailer we are mainly treated to a run through of Wahlberg's Sgt. Tommy Saunders as he goes about his routine before leaving for duty on April 15th, 2013. 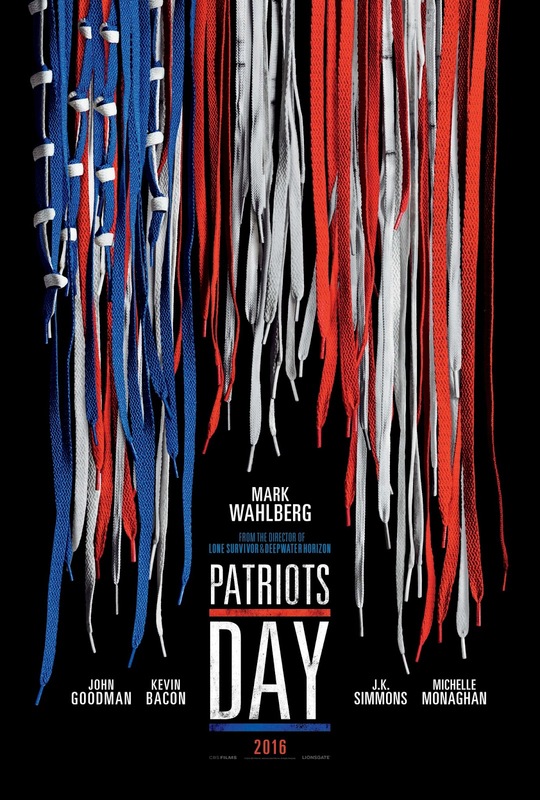 This first look is clearly meant to elicit the American spirit of the piece with more American flags popping up here than a Michael Bay flick while the trailer is scored with a piano version of "America the Beautiful" that resonates in an effective way when paired with the vague images suggesting the real terror that took place that day. While Lone Survivor was on of the best films of 2013 in my opinion and despite the fact I can't yet speak on the quality of Deepwater Horizon I'm inclined to be excited for what Berg and Wahlberg will deliver here as they seem to have tapped into a specific niche of their own that they find both interesting and artistically fulfilling. We'll find out if they can keep their streak alive when the film begins its awards-qualifying run on December 21st. Patriots Day also stars Michelle Monaghan, John Goodman, Kevin Bacon, J.K. Simmons, Melissa Benoist, Rachel Brosnahan, Alex Wolff, Michael Beach and expands wide on January 13, 2017. Synopsis: In the aftermath of an unspeakable act of terror, Police Sergeant Tommy Saunders (Mark Wahlberg) joins courageous survivors, first responders and investigators in a race against the clock to hunt down the bombers before they strike again. Weaving together the stories of Special Agent Richard Deslauriers (Kevin Bacon), Police Commissioner Ed Davis (John Goodman), Sergeant Jeffrey Pugliese (J.K. Simmons) and nurse Carol Saunders (Michelle Monaghan) this visceral and unflinching chronicle captures the suspense of the most sophisticated manhunt in law enforcement history and the strength of the people of Boston.